Sky Q voice control allows you to search by famous movie quotes | What Hi-Fi? You can now search for films and TV shows on your Sky Q box by simply quoting a famous line from the movie you want to view. Talking to your technology is all the rage, with products like the Amazon Echo speaker, or Google Assistant on Android TVs. Now Sky is getting in on the action with voice-controlled functionality on its Sky Q box. Simply press and hold the voice button on the side of the Sky Q touch remote and say what you’re looking for (whether it's a movie title, TV series or something more contextual like "Liverpool match"). 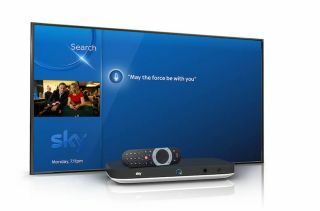 The Sky Q box will oblige by searching for the relevant film or show. You can also search by genres, star ratings, leading actors or directors. Those feeling a little more "adventurous" can search using iconic movie quotes. For example, “Say hello to my little friend” brings up Scarface and “I'll have what she's having” searches for When Harry Met Sally. Voice search has been promised since Sky Q launched, with Dolby Atmos support, voice control and a number of other features set to follow during the course of 2017. The latest update also sees Sky make some alterations to its user interface. The My Q section becomes the new Sky Q homepage, allowing customers to personalise their home screen with recommendations based on "household viewing and top new series from all channels across Sky Q". You can also use the app to sign into a Facebook profile and watch your Facebook videos with the My Photos app.